The Schoology® Blended Learning PD Program is a nine-month professional development offering on blended learning topics. Using the Schoology® platform and tools, school teams participate together to transform their educational environment with a shared vision for learning. School teams engage with other school teams to collaborate and develop professional networks. The Schoology® Blended Learning PD Program, grounded in research-based strategies, models best practice to combine face to face, synchronous, and asynchronous sessions to explore trends in blended learning; all the while practicing strategies and using tools to build activities for use in the classroom. 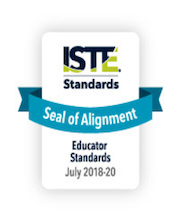 The Schoology Blended Learing PD Program underwent the International Society for Technology in Education (ISTE) Seal of Alignment review for Proficiency. Resources receiving this recognition offer the opportunity, encouragement, and resources for participants to show significant and substantive growth in the skills, dispositions, and behaviors identified in the standards. Educators who complete this program will have a thorough understanding of the ISTE Standards and will gain the knowledge and skills to create engaging learning experiences for students. “Educators who complete this program will have a comprehensive understanding of blended learning, utilizing all of the tools available in Schoology."